Speaking two different languages and translating two different languages are completely different things. Professional interpreters have special translation skills and work incredibly hard to continually develop those skills. That being said, one can notice the importance of professional interpretation most when translation mistakes are made. In China, a restaurant owner attempted to translate his restaurant’s name and received an error. 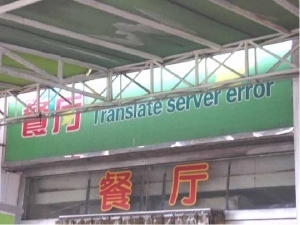 The Chinese word for “restaurant” into English came back from the AI machine translator as “Translate server error.” Thus, the owner named his restaurant. Finger lickin’ good. Too bad the giant fast-food chain mistranslated their famous slogan in Chinese as “Eat your fingers off.” They were able to correct this after realizing the mistake, but if they had a professional translator in the first place, they could have avoided heavy financial losses. Businesses aren’t the only ones to suffer from misinterpretations. A hospital ended up cashing out $71 million in settlement money for delay in proper treatment after a bilingual staff member incorrectly translated “intoxicado” as “intoxicated.” A professional translator would know that “intoxicado” is more closely referring to “poisoned” and not alcohol or drug-related. The delay of the food poisoning treatment left him quadriplegic and $71 million richer. Even the foreign exchange market can benefit from professional interpreters. After a poor English translation of a Chinese financial report, the market panicked thinking the report was severe when it was actually quite speculative. Whether a small business, large business, a giant corporation, politician, medical, federal, or religious entity…professional interpreters are a necessary investment. One simple mistake in translation can cost far more than the prevention of that mistake from hiring a professional translator. If you’re interested in translation services, contact Atlas Language Services to get the best solution for your needs.